Today I had the pleasure of presenting, "Storytime 101: Rethinking the Basics" as part of YSS Powerhouse Presents, a series of webinars geared toward all things youth services! All of the webinars are sponsored by the Youth Services Section of the Wisconsin Library Association and you should join today if you're not a member! A special thanks to the South Central Library System for hosting me today and making the process extremely fun and easy. My slides are full of great links below so check them out. If you're interested in the recording of the webinar, check here. I hope everyone had fun listening in to my flu riddled self. Good thing it was a webinar so you all couldn't catch my germs! We've changed up our Play & Learn area with a food theme! 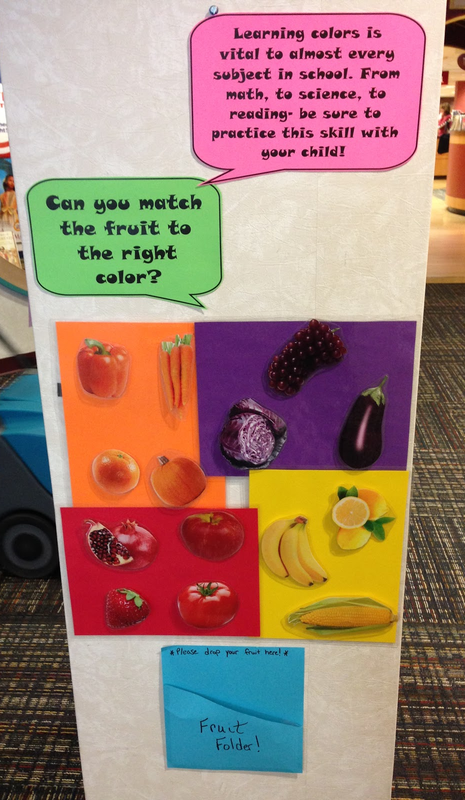 Our pillar game this quarter is all about matching the fruits and veggies to the right color. We include a fun parent tip as well as directions for the games. I tried to pick fruit that was recognizable (like grapes), but also throw in some new vocabulary words (like pomegranate). I simply put velcro pieces on the back of the fruits and vegetables and put the other part of the velcro on the right colored paper. We also made this cute little folder to hold all the fruit when kids are done. I've seen parents counting the food, talking about what the food tastes like, and even making up food stories! It's been awesome. Tune in next week when I reveal the flannel story and big furniture piece we've added. 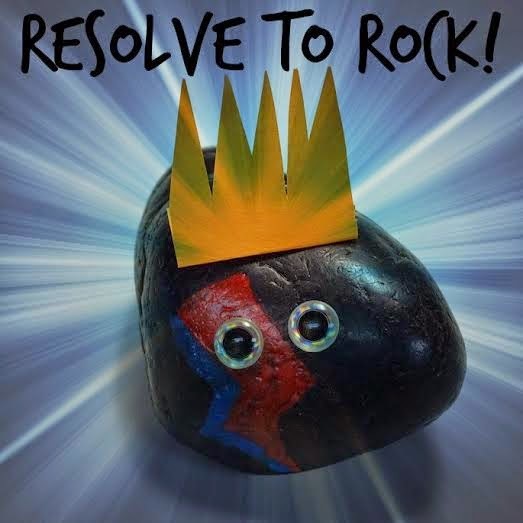 I'm participating in the Resolve to Rock initiative with Storytime Underground. It's all about setting your professional goals in 2015 and holding yourself accountable for them throughout the year. So, without further ado, here are my top 5 goals. 1. Make Stronger Community Connections. I've started on this already by enrolling in a class called "Early Literacy Community Development". I'm partnering with a local parenting resource center to investigate how to better serve our community. Hopefully, this will start us in the right direction for our community. One of my big goals this year is to make our way back into headstart and local daycares. We've had connections in the past that need some love and nurture to bring back. This year my goal is to find the time to make this happen! 2. Keep Trying New Things. Next year I'm doing my first ever webinar and solo presentation. I'm extremely nervous about them, but also so excited! One of my goals is to keep trying new things this year. This includes everything from storytime books, to blogging, to continuing education opportunities. There is so much out there to explore! 3. Get Out of My Comfort Zone. I've been fortunate enough to make some amazing friendships through library. Some of my closest friends have resulted because of my library/blogging ties. While this is amazing and I love them dearly, I'm going to try really hard not to depend on them during conferences. It's so nice to have people you know walk the exhibits and go to sessions with you, but I've been thinking a lot lately about the connections I could be missing because I'm no longer "looking". Maybe a new best friend is sitting 2 chairs over super uncomfortable because she knows no one (me 2 years ago), or maybe someone in the row behind me is looking for an early literacy consultant and they want to pay them a million dollars a year (obviously the dream). Point is, I want to make sure that I'm leaving myself open to these interactions at conferences. Chances are you'll still see me with a buddy at ALA, but I'm hoping to go solo for at least a few hours. 4. Stop the Negativity. This is a super personal one for me that I think will also be the hardest. I have a tendency that when I get annoyed/mad/irritated with something that it gets very hard to move past it. Of course once I've reached this level of annoyance I have to tell someone about it so I usually turn to my coworkers, friends, or husband. Totally normal behavior I know, but I've realized that this does nothing for me other then feed the negativity. Once I start ranting about something it's hard for me to move on to more positive things that day. So, my goal is that I just won't invite the negativity in during the day. Obviously, we all know there will be exceptions to this rule but I'm going to try so hard to follow it. Maybe I'll start a chocolate reward system for myself for every day I go without negativity? 5. Be More Like Beyoncé. There's really nothing else to say.